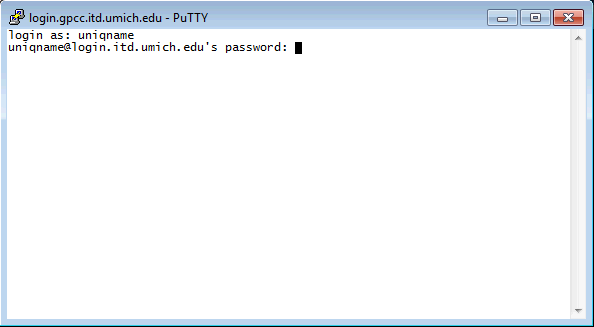 Members of the U-M community can download Putty (bundled with WinSCP). ITS provides a number of shortcuts, or profiles, with PuTTY, to make it easier for you to connect to popular host computers at U-M. Here's how to use them. Make sure you have a working Internet connection. If you use a modem, establish a dial-up connection. If you use Ethernet, your connection should already be available. The UM Internet Access Kit folder is included in the download of PuTTY. In that folder, you will find several profiles, including one that you can use to connect to the ITS Login Service. Double-click the profile that you want to use. To open a terminal connection to the ITS Login Service, for example, double-click the ITS Login (terminal) icon. When you first attempt to connect to a new server, you'll get a warning message window that looks like the following. Click Yes to continue. At the login as: prompt, type your uniqname and press the ENTER key. IMPORTANT! Connect to login.itd.umich.edu to run programs on the Login Service. If you want to transfer files instead, use WinSCP to connect to sftp.itd.umich.edu. See Using WinSCP to Transfer Files With SFTP [Windows]) for details. At the password prompt (as below), type your UMICH Kerberos password and press the ENTER key. 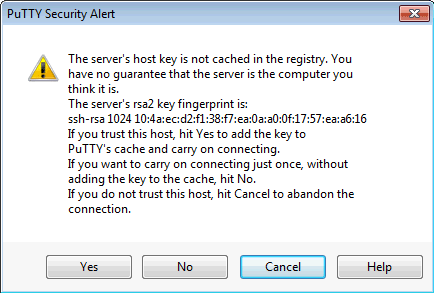 To open a connection to a host computer for which there is no pre-configured profile, open SSH Secure Shell and then open a connection. You will need the host name of the computer to which you want to connect. In the U-M Internet Access Kit folder, double-click the PuTTY icon. The PuTTY Configuration window opens. In the Host Name (or IP address) box, type the host name or IP address for the server to which you wish to connect . In the Port box, make certain that you've selected the correct port number (most frequently, the default port of 22 is fine). In the Saved Sessions box, give your session a name by typing a title and click Save. Your session name appears in the list of sessions. From that list, select the session name for the server to which you wish to connect by clicking on it, and click Load. Click Open to begin your session. When you first attempt to connect to a new server, you get a warning message. Click Yes to continue. Log into the server by following the documented instructions for that server. Log out or exit from the host computer to which you connected. You can usually do this by typing exit or logout then pressing the ENTER key. You should always exit or logout before closing the window on your session. When you've done this, your session with the host computer is terminated and the PuTTY window will close. Visit ITS's Information System to obtain ITS computer documentation and other resources.